Prothane's polyurethane bushings are a much more durable material than rubber and will hold their shape, and grip on your sway bar much better. 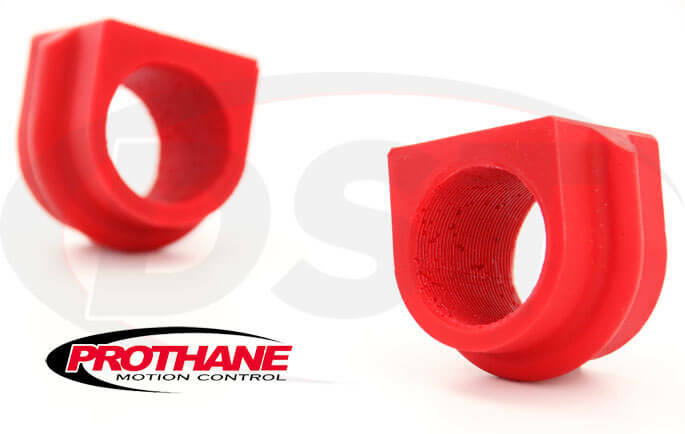 Prothane's Polyurethane Front Sway Bar Bushings hold the front stabilizer bar in place better than stock rubber, reducing body roll, increasing traction, and improving handling during a turn. Find polyurethane bushings for your front sway bar below. The front sway bar connects your front wheels and levers the inside wheel down during a turn to maintain traction, but if the original rubber bushings that hold the bar to the frame are worn and misshapen then the bar has a hard time doing it's job. This can lead to things like increased body roll, clunking noises for the loose sway bar, or even loss of traction during a quick speedy turn. Prothane's sway bar bushings are made with polyurethane and don't flex like rubber, so your sway bar stays in place and keeps your wheels planted during a turn. Prothane's polyurethane bushings are a much more durable material than rubber and will hold their shape, and grip on your sway bar much better. The effect of upgrading to these aftermarket bushings is actually similar to that of installing an expensive large diameter sway bar, but for a fraction of the price! Whether it's years of commuting on Texas highways or laps at the local track, these bushings will improve turning performance for life. Prothane's sway bar bushings are Made in the USA and come with a Lifetime Warranty, so you can rest assured that you're getting a quality product.